I have a 3.27 posi 9 bolt in good condition. it does not need overhall or repair. im going to pull the axles so I can switch the caliper mounting plates. im converting iron calipers for pbr. I see ill need a slide hammer, but I will not need to press the axles back in because im only changing the caliper plates correct? A slide hammer is your best method, however, I have always been able to get the axles out by simply tapping the back of the axle flanges with a med hammer. Tap and work your way around and they should come out. To reinstall, I usually just tap them back in with the hammer, sometimes with a block of wood if they are stiff. Be carefull when you have axles out not to work or cause the differential spider gears to move. Inside the posi the clutch flange and spider gear both have to be almost perfectly alligned to allow the axle splines to fully engage. 99% of the time this won't be a problem just make sure you don't turn the axle with the drive shaft locked down. Since the axles are in place now the splines are alligned. It should all go back together smoothly. However, if upon reinstallation the axle goes in to the splines about 1/2" and stops, that may be the reason. You probably want to put some PB Blaster or similar on your retaining bolts prior to the work. They like to corrode and stick because they collect moisture. A very light dab of anti-seize on the inside and outside mounting surface of the brake rotors help too. That way they don't bond to the rim or the axle flange the next time you take it apart. Don't be surprised by few quarter sizes spots of differential oil loss. It likes to collect on the bottom tubes and you will get a very little bit as you pull out the axles. If you do get the splines out of alignment it's more work but you just need to get the rearend positioned where you can turn it over slowly by hand (transmission in neutral or with the driveshaft out) to get the carrier and posi cone splines to realign again. As you do it with any luck the axle will pop right back in. It's sounds easier than it is. Took me 5-10 minutes messing with it last time. Also if you have any nasty looking wheel studs or wanted to use some ARP longer ones now would be the time to have new ones installed. I think all 9 bolt GM rearends are posi units. you will microweld (friction weld and then break free in many microscopic places) the cones to the carrier 1000s of times per "slip"
this just errodes both away. the borg warner cone centre was designed for mopar 8 1/4 inch diff hence my preocupation with sure grip additive. Any re-seller in the US? Don't know about the Lucas oils but I used a Pennzoil product that was supposedly for limited slip differentials and the diff creaked and popped until I put the GM additive in. There was such a pronounced difference after adding the GM stuff it was amazing. I had actually thought I had put something together wrong it made so much noise. I had shimmed to "0" play so it was tiiight. The GM additive is all I use now. I don't have the part number but it should be listed earlier in this thread. Prior to shimming it would turn both tires in a straight line but when turning right only the inside would spin. 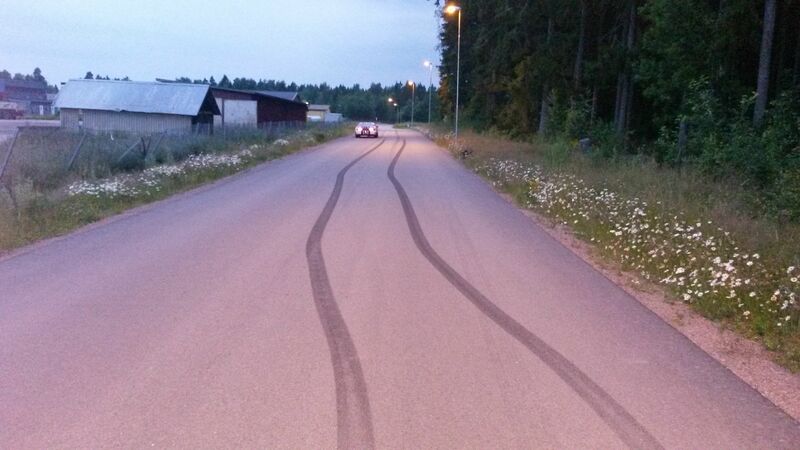 After about a year or two of pleasure driving and a couple of trips to the drag strip it will still turn the car sideways during a right hand turn (off road- closed course driving lol) and paint 2 equal length stripes on the road so it is holding up well. Jack up the rear and spin the tires, if they spin the same way you have a limited slip differential. Just a quick check, an M80 LSD won't fit in a M78, but a M75 will fit in a M78? you have to machine the slightly-domed face of the pinion head for other ratios (common across many brands) diff head is big, hits carrier before you get good pattern, the lower the number of your ratio. I call that a bargain, hence have one on order. strange engineering didn't like the small half shaft bearing and suggested i get mopar housing ends welded on... didn't wanna do that so went with moser. M75 is a 7.5 inch ring gear beam axle, with a slightly smaller housing but the same posi as an M78. you can get an M78 gearset in but you have to grind the housing entrance. M76 is the rule breaker its an M75 ring gear in either an M76 IRS housing or an M75 ring gear in an M78 beam axle housing. still got a 7.5 inch ring gear mind. the only seperated cone based slip resistant beam axle called M86 they made was a limited run for the last of the VJ Valiant chargers (was designed to go behind a mopar 340) rare as Hens tooth paste hard to rebuild and sort after by about 40 australians with specifcally optioned VJ valiant chargers. it looked like an AMC 20 from the rear big heavy thing gets called a dana but isn't and never was. you won't see one in the states ever. they also made M55s and M60s for teeny tiny cars in the 60s but nobody knows anything about them and a doubt they were LSD. or jusrt risk it. 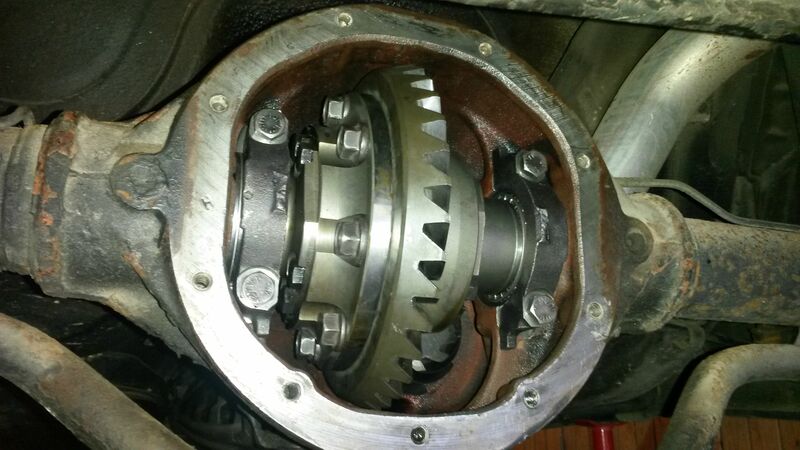 the gear is held on by friction between it and the flanged caused by the bolts being tight like a wheel is. they are not in shear stress. So this will fit in my 9bolt which has a 3-series carrier and the original 3.27 gears with no modifications? Or do I have to machine anything if I have the stock 3.27 gears? so you would put your pinion in a lathe and remove a few thou from the top of its head after you have recorded any setting depth info stamped on it. these work best with 3:7:1 upwards where the pinion head is smaller , then you don't have to machine the pinion head face. you have to do this work with many of the aftermarket centres a competant diff shop will be used to haveing to do this. if I'm not changing the gear ratio, I'm reinstalling the same factory original gears, keeping the same pinion depth shims, could I just touch the head of the pinion with a grinder to get the needed clearance between the pinion gear and the fatter diff? I know, not as elegant as taking it to a machine shop. Well, that is going to be the most stupid question ever, but I'd like to be sure: is this topic 9-Bolt Rearends (295hp rated) the one that comes with the 1989 GTA? It has 150k miles, and seems to be ok, expect for a slightest oil leak at the end of the right axle end. Mechanic says it's ok.
Should then I be worried about doing donuts/burnouts? Yes, your 89 GTA got the 9 Bolt Borg-Warner Australian built rear axle. Only way to know if it's good would be to pop the cover and check the cone clearances and planetary assembly. Well, if I open it, I would have to change oil too, and what if I discover something wrong? Here in Italy could be a problem. I prefer to wait till something bad happens. Secure car safely with wheel chocks etc, remove handbrake and place gearbox into NEUTRAL with the vehicle off. Raise one rear wheel from the ground . Measure the torque required to rotate the wheel that is off the ground. This is called the breakaway torque, and if less than around 35lb/ft the centre requires attention -- either shimming or cone replacement. NOTE: A very quick test can be done without the use of a torque measuring apparatus by hand by attempting to rotate the raised tyre by hand. As a rough guide an average person should have a reasonable amount of difficulty rotating the raised wheel, if able to do it at all. I can now confirm that the Helical Gear LSD that dave999 mentioned, indeed fits the 9-bolt. I just finished the install in my car tonight! See my full install post in "Transmissions and Drivetrain"! A very special thanks to you "dave999" for telling us about this! So is the differential/posi you are installing a 28 spline? Do you know if there is a 31 spline available? I am considering a conversion to 9", 12 bolt or possibly the ford 8.8. But my 9 bolt if working fine and the main concern is the axels (from what I read on 9 bolt site) and I know I have a twist in one of mine. I noticed there are 31 spline cones for the stock posi and if I am getting axels made it may as well be 31 spline units. If in the future I needed a posi I could possibly go this route if the 31 was available. I know that everyone says the small ring gear is still a problem but others have said the stock 9 bolt with good axels is better than their reputation. I put over 400 HP to the rear tires on motor and over 500 HP with nitrous. With a stick shift transmission I would really like to be able to leave harder but have yet to really try with the stock 9 bolt. I don't mind pushing the limit but want to be safe doing so. The diff i bought was a 28-spline, I reused my stock axles and just installed new seals and bearings on them. My axles looked great, no twists and the splines looked like new, no wear at all. My engine is completely stock though, and I don't know how everything would hold up to more power. so I bought the carrier bearings and axle bearings and seals did they change the design of set 9? axle bearings they look like they will fit but they are not the normal cone bearing that I pulled out . the new ones are 1 piece with a lock ring retainer but they do come with the separate retainer ring im just wondering how to install it as it looks like the bearing would need pressed on to axle shaft and then would then need also need pressed into the housing but im thinking if pressed into the housing it would damage the seal ? the old style bearing can separate to allow the axles to be pulled out the new bearing would break or be damaged doing the same ? my recollection is that the different brands had differing configurations for the bearings and bearing races. i had bought several different brands, scraping the bottom of the RockAuto barrel, but in the end, only used the Timken bearings. as i recall, the bearing race should slide out of the axle housing, it's not a press-fit. if it's attached to the bearings themselves, then it should come out with them. if it's the original style like the Timkens, then you can pull it out with your fingers. i think the slide hammer is used to pull the seal out, and also to break any form-fit that may have occurred between the axle splines and the spider gears. just my recollection from having done this task a few years back. Did this on the left side (again...) about two weeks ago since the (not even one year old National Seal brand) axle seal started leaking suddenly. Turns out the seal I put in when I restored my rear had a manufacturing defect. Since I had to replace the bearing again as well because you have to destroy it in the press when you take it off, I can tell you that the inner and outer race seems to be _glued_ together on new bearings (At least National Bearings brand) for easier installation. Keykey, how do you like the Torsen? I checked with Supa F Series about one and they are $545 aud for the unit plus $240 to $300 shipping to Kentucky. Kinda pricey. I love it, I'm so glad that I don't have to deal with the stock cone diff anymore, and the oil still looks like new since I put it in as there are no more metal flakes from the cones floating around . It's still working great and I consider it the best upgrade to the car so far! Anyone happen to know the outside diameter of the 9 bolt axle tubes? Are the the same size as a 10 bolt? 9bolt.com has this available and the shipping is less but the cost is more so it probably works out about the same. Glenn is probably the expert on this rear end. Currently working with him on a 31 spline carrier and gears. It's hard to justify spending the $$ on this rear but should be a good deal in the end if it holds up. Thanks man. I'm doing a 8.8 swap and needed the axel tubes but they have to be he same size as 10 bolt tubes. So I need to get a 10 bolt now. I have not measured the outside diameter of a 9 vs 10 bolt but the sway bar brackets appear to be the same for both so I suspect the outside diameter of the tubes is the same. Don't just go by the bearings. The 9 bolt uses a totally different type of bearing and axle retention than the 10 bolt. If I were welding stock tubes to a 8.8 ford rear chunk I would probably use the 9 bolt tubes since they have the bolt in axles which don't require c clips. Once the housing is together I would have custom axles made with outer bearing/flanges of a 9 bolt and length/splines to match the 8.8. If you have a 9 bolt housing available I may be interested. I am looking to build up a 9 bolt and just need a good housing. Let me know if u get those measurements. Any as for selling you the 9 bolt I'm not against it but the shipping might be crazy from Ohio to get it to you. Any chance of getting a list of years and models (were any offered in the Camaros of any model? If so what years?) put into the first post in the thread?